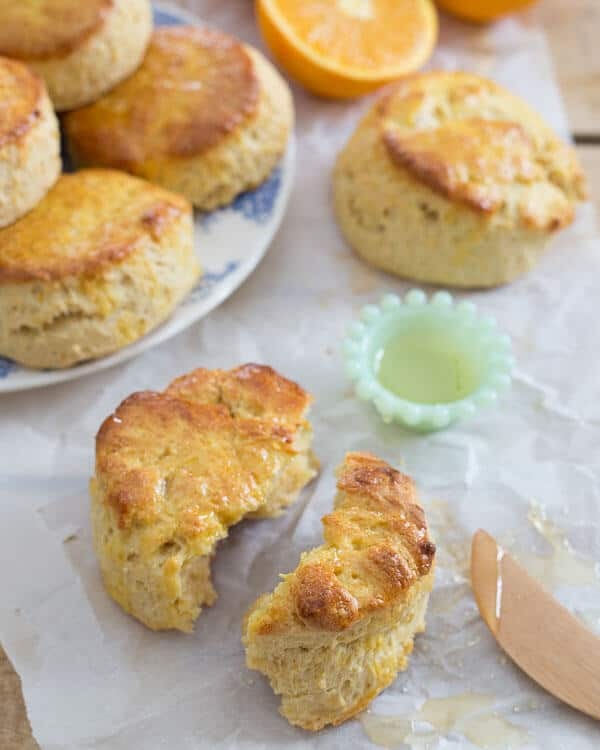 These citrus honey biscuits are filled with the sweet flavor of honey and the bright freshness of orange and meyer lemons. They’re a delicious addition to your breakfast plate. There’s a part of me that thinks I’d get along juuuust fine in the south. Warm weather, flip flops year round, the ability to say “bless her heart” and then be justified in talking smack about someone without my character coming into question and…biscuits. How can you not love a place will all those things? Oh, right; the snails pace that everything moves at. Considering a 10 minute wait at the post office can put me over the edge (although that might be more of a competency issue than anything else), Southern life might, in fact, not be in my best interest. But, I do really like the biscuit part. I don’t think I’ve ever made biscuits before this. Scones? Yes. But not biscuits. Isn’t that sad? A scone is great and all (especially when they have that big sugary topping), but nothing beats the doughy, yeast-like (even though there’s no yeast in these) center of a biscuit. Biscuits scream, “I’ll take 2 fried eggs, a side of bacon, hash-browns and the biggest mug of coffee you have”. Since it’s January and the only freshness we have going on in the fruit department is citrus, I decided to bring some flavor to biscuit town with it. 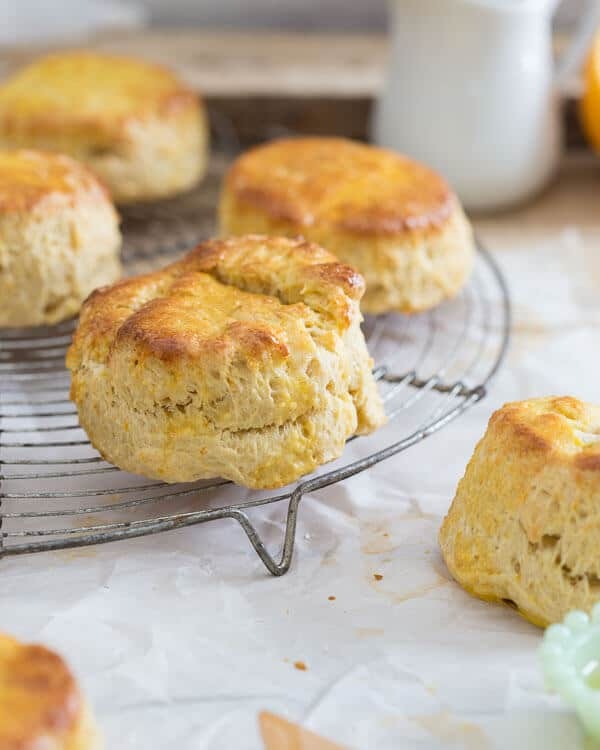 Orange and Meyer lemon zest along with fresh orange juice gives these biscuits a hint of citrus brightness to them. Not really the pour some-gravy-over-top kind of biscuit and more so the eat-on-the-side-of-your-breakfast-plate kind. While I may be a newly minted biscuit girl, the gravy thing freaks me out. The biscuits also get a boost of sweet honey flavor from Honey MELT® Organic. Instead of using butter or shortening, I went with MELT Organic in these. It’s a luscious blend of good fats like coconut oil and flax seed with a great balance of Omega-3s and Omega-6s. 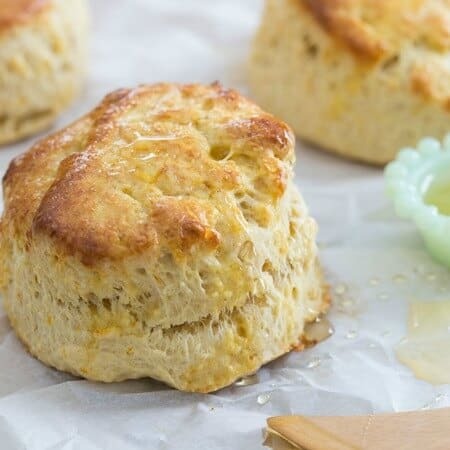 The honey version is made with organic wildflower honey and cinnamon and gives these biscuits the perfect touch of sweetness to balance out the citrus. Not only is MELT Organic amazing IN the biscuits, but slathered on a warm one straight out of the oven (or reheated in the toaster oven as I’ve now been doing for days) it gives an added level of creamy richness to each bite. Bless their hearts, but I’m betting southerners could learn a thing or two from these biscuits. 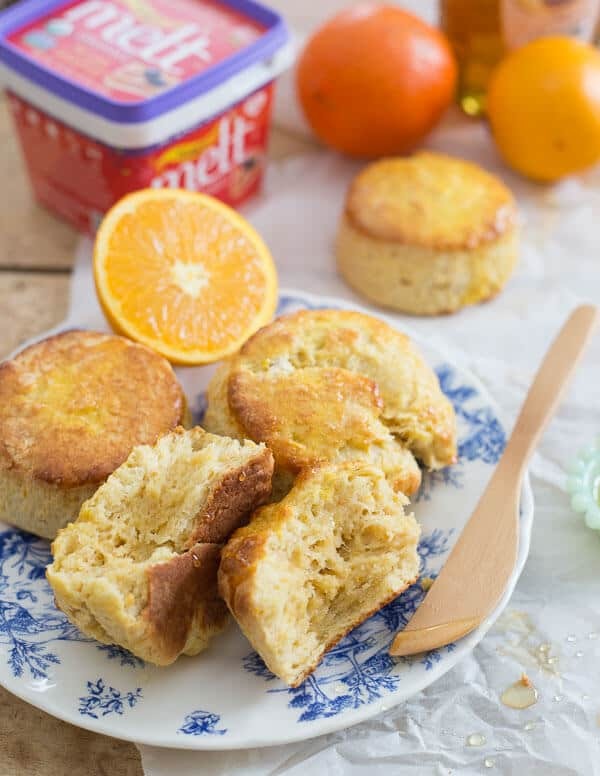 These citrus honey biscuits are filled with the sweet flavor of honey and the bright freshness of orange and meyer lemons. They're a delicious addition to your breakfast plate. Preheat oven to 400 degrees. Line two baking sheets with parchment paper or silpat. Combine the flour, sugar, baking powder, baking soda and salt in a large bowl. Add the diced Honey MELT Organic and work into the flour mixture with a pastry cutter, fork or even your fingers until the texture of a coarse meal. Beat 1 egg in a medium bowl. Add the yogurt, zests, orange juice and honey and whisk together until smooth. Pour the wet ingredients into the dry and stir with a spatula until just barely combined. Turn the dough out onto a floured surface. Knead a few times until it comes together and then roll into a circle about 1 inch thick. Using a biscuit cutter or rim of a glass, cut into circles. Place biscuits on the baking sheet. Combine scraps and roll out again to use all the dough. Beat the remaining egg in a small bowl and brush the tops of each biscuit. Bake for 12-14 minutes until tops are golden brown and biscuits are cooked through. Remove from the oven, let sit a couple of minutes before serving warm. 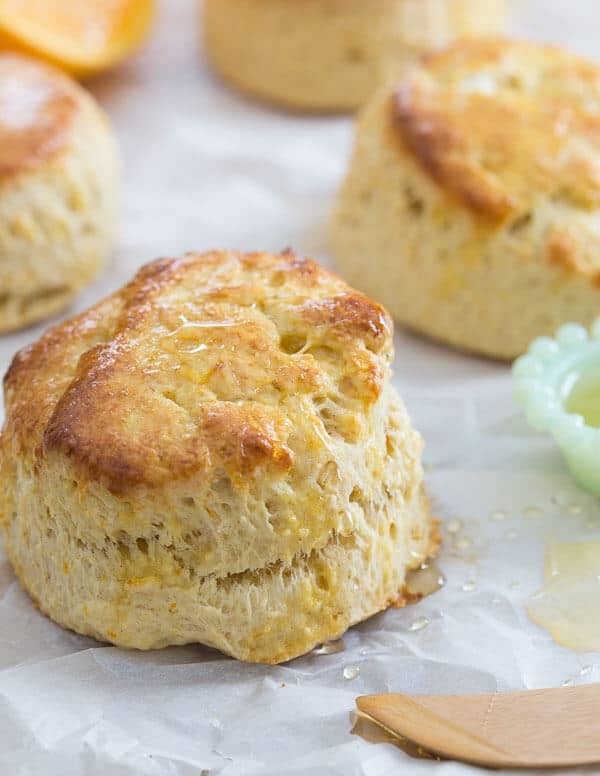 Love this recipe for Citrus Honey Biscuits? Try other biscuit recipes like Vanilla Butternut Squash Biscuits, Gluten Free Chocolate Biscuits, and Sweet Potato Bacon Biscuits. I love that you brought some flavor to biscuit town! Bless. These are just love little biscuits! The citrus and honey sound delicious together. These look great :) And I know the bit about southern life moving at a snail’s pace was just part of your story, but I just wanted to say that many of the cities in the south are quite lovely. Definitely a little “slower” than NYC, but where isn’t? I’m drooling! your pictures are mouthwatering! Love the flavor combo! My aunt and uncle live in the South and are VERY Southern, and while I love some parts of their lifestyle, the slowness just kills me. The biscuits, though. I could live on those. Love the citrus/honey combo here! I adore these biscuits! Honey and citrus are wonderful when paired together. I grew up a southern girl and I absolutely love the laid back lifestyle. Anything too fast pace stresses me out, including the highway. I’m totally a biscuit girl. . LOVE these, Gina!!! We call ‘cookies’ biscuits here in Australia so was shocked when I tried one in America but was in love- these look delicious. Gina! What can I replace the honey MELT organic with? Hi, I would love to try this recipe but I am not sure if I can get Honey MELT Organic here (in Slovakia). What would you recommend as a substitute for it? Can I use for example coconut oil? Not sure about coconut oil b/c you need the fat to be cold and able to be diced. I would do regular butter instead. These look absolutely delicious, although I’ve recently started a gluten free diet experiment, so I’ll just have to figure out a way to make these minus the gluten. I’m also so happy to read about the honey Melt, I’ve seen it in my local store but never investigated, I will definitely be buying some pronto!